After the main highlight of our day, we decided to scurry over to the mission. Our itinerary was jam packed with activities on this particular day, but thankfully we managed to squeeze in an hour to take a self-guided tour of the mission. I didn't get to spend the amount of time I would have liked, to explore, linger, and read into the history of the mission, but we made do with the time at hand. 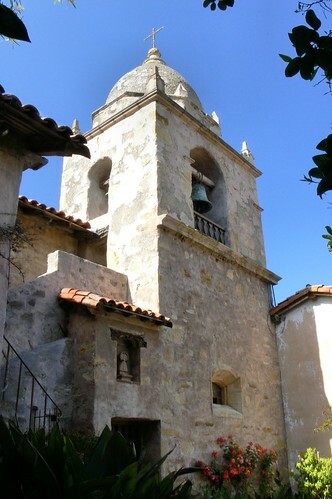 The Moorish style bell tower holds nine bells. Just as we pulled into the parking lot, a gigantic charter bus pulled up and began to unload. Determined to stay two steps ahead of the horde, we rushed in past the crowd. The mission was closing at five, so an hour was all we were granted to absorb all the history we possibly could. 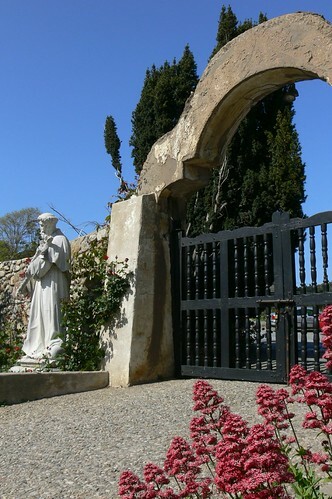 The mission was founded in Monterey on June 3, 1770 by Padre Junipero Serra. The location was soon changed to Carmel because of certain issues with the current location. 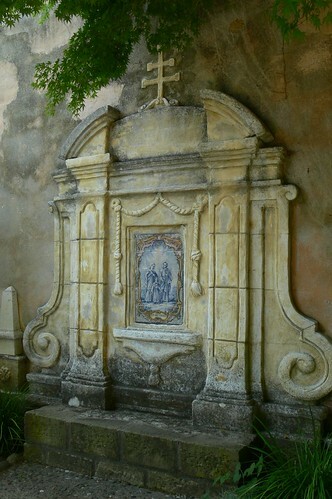 Padre Serra also founded eight other missions during his presidency. Junipero Serra died on August 28, 1784. 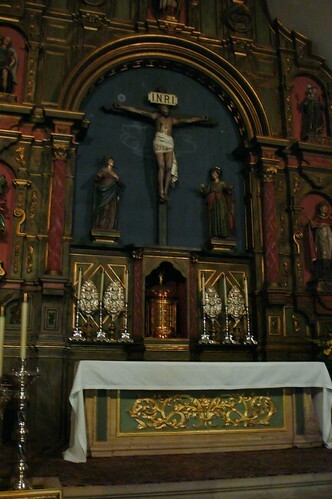 At his request he was buried beside Padre Crespi before the main altar. *On the right, you'll see Serra's grave. Our tour took us through the Basilica, cemetery, and museum.......throughout the courtyards were many statues, and effigies all weathered by time. To be amongst history of this magnitude was very uplifting. 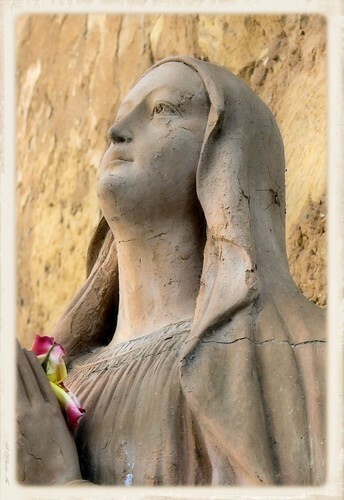 One of my favorite statues was one that overlooked the cemetery, she was lovely. *A closer look at her praying hands can be seen in the first photo. I encourage you to look at some of the other photos belonging to this set so you can see other sights I haven't shown you here. This historic Mission has been renovated to it's previous glory as both a Catholic Mission and now a thriving parish and school. Info from Wikipedia(link). *Pretty interesting, there's also a photo of the mission circa 1910. Sorry, I couldn't give you more detail myself, but we've had a very busy weekend and I wanted to share this with you sooner rather than later. Thank you so much for sharing this visit with us. I agree with you that we are unable to truly understand how far we have come, unless we look at where we have been. As always, the way you write encaptures the reader, and this is so perfectly complimented with the photographs that you include in your post. The textures and colours of each image provide a feeling of almost being there. That church is so gorgeous! I know I don't really do religion but I can see wanting to get married in a place so gorgeous as that. Your trip was truly amazing! Beautiful pictures. This makes me want to go on vacation SO badly!!! Oh wow, this is stunning. I can see why you would want to beat the bus crowd and soak it all in on your own. This is purely divine! The grounds, breathtaking. The history, totally fascinating. I would love to go see it for myself. Thank you so much for sharing this, I would not ever have heard of it otherwise. 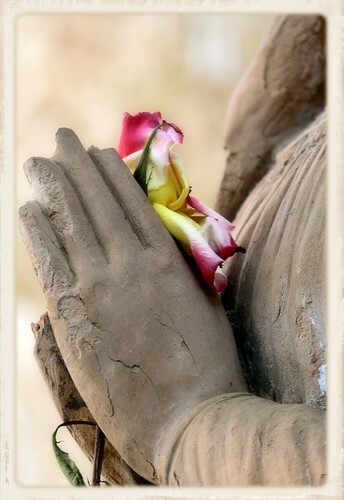 The shot of the statue's hands holding flowers takes my breath away! That could win an award, blue ribbon. I looked at your other mission shots from the link and saw the comment left there about this same photo - and agree with the commenter. I also just paid a visit to the Verve link; wow, that's a whole new thing to me and very interesting. Your world is beautiful and you show us our beautiful world through your lens. Lovely. Very very very very very GOOD PIC's Did i say really really really really GOOD .what i'm trying to say really very GOOD.you know when you get it spot on.good feeling. I love the statue, you have captured her so beautifully. The close up of the flower in the hands is a very nice touch. You have managed to capture a kindness and and a feeling of safety in her. 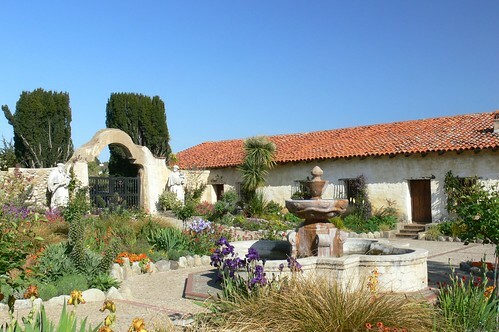 The mission looks like a great place to explore and learn local history. WOW. I really want to visit this place. Great pictures. getty: It is my pleasure, really. I very much enjoy sharing my experiences. I always like recognizing how different I have become over the years, looking into my past allows me to see that. dolce: Thank you....you will & should! gillian: If we hung out with the crowd we would have gotten to listen to the guide, but then people would have been in my way when I was trying to capture an image....can't have that, now can I!! Maybe there is a mission near you which would be just as interesting? liss: It was a great place to explore after a day of hiking near the ocean! greg: Wow is exactly what I said as I walked up into the Basilica.....it was truly captivating! wow! 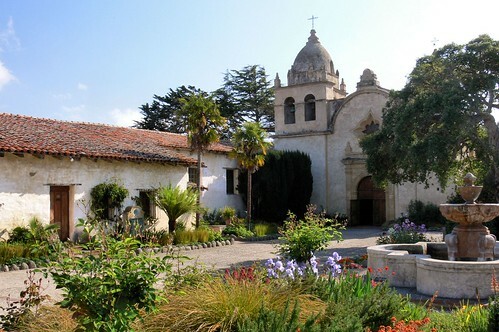 I can't believe how beautiful and striking the mission is... and all in Carmel? I am going to have to visit. You are opening my eyes to this great state I'm living in : ) thanks. The first photo is just perfect, it caught and held my eye for the longest time. Great treatment on it!! Great pics! :) Super pretty place. just a 10 out of 100. Ha Ha Ha. very very very very very very 10/10 must do better.LOVE to you and him indoors. Nice photos...meticulously taken with a sense of creativity. 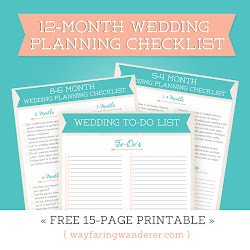 a little bird: Maybe a road trip is in store for you yet!! prin: Thanks, it surely was. camila: Brazil, oh I bet it doesn't compare.....maybe I'll get to go there one day?! One of the things that I love about California is the variety of plant life and the mission there in Carmel is home to such an amazing variety of color. Wasn't Clint Eastwood the mayor of Carmel at one time? meridith: You know, I don't know if Clint Eastwood was ever mayor?!?! I'd love to see this place in person. The photo of the hands w/flowers is beautiful.